We made maple syrup! Almost an entire pint of it! Tomorrow is Nate’s birthday, so Alistair and I are very excited to wake up early and cook Daddy pancakes with maple syrup from our own backyard. Since this winter has been brutally cold, the sap wasn’t consistently running until this week, so on Monday evening I gathered nearly two gallons of sap from the only sugar maple we have tapped. The sap was tinged a very light yellow, which worried me. Did the disgruntled squirrels pee in my sap? We have had some light snow and rain, so I thought it might be contaminated from that, but it turns out that each tree produces its own sap color variation, and there is no need to dump it, even if it’s a deeper yellow. 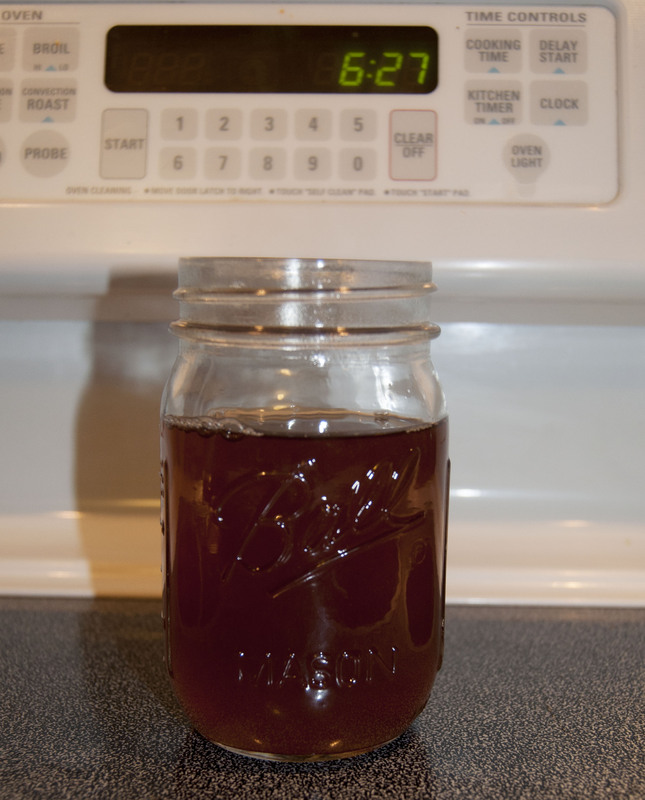 I stored the sap, as yet unfiltered, in the refrigerator in six quart-sized Ball jars. 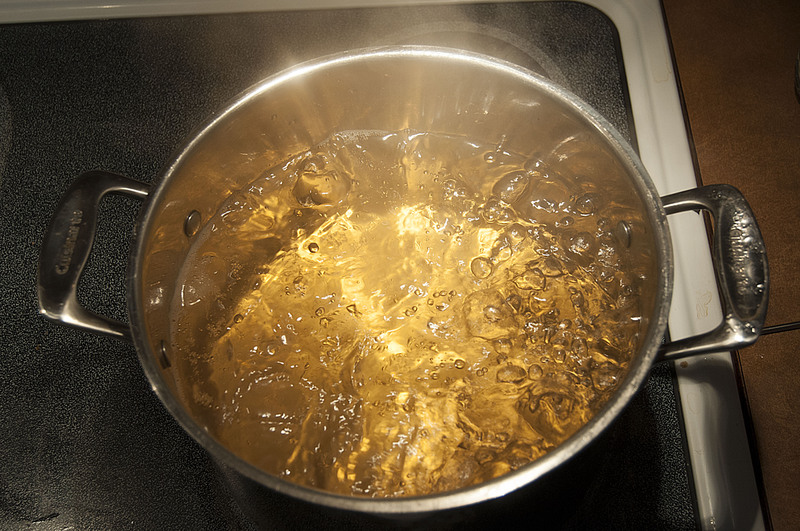 Most seasoned sugarers suggest boiling sap within 48 hours of collection, though many weekend hobbyists store it for up to seven days in the fridge. This afternoon I initially filtered the sap through cheese cloth into a large stainless steel stock pot. 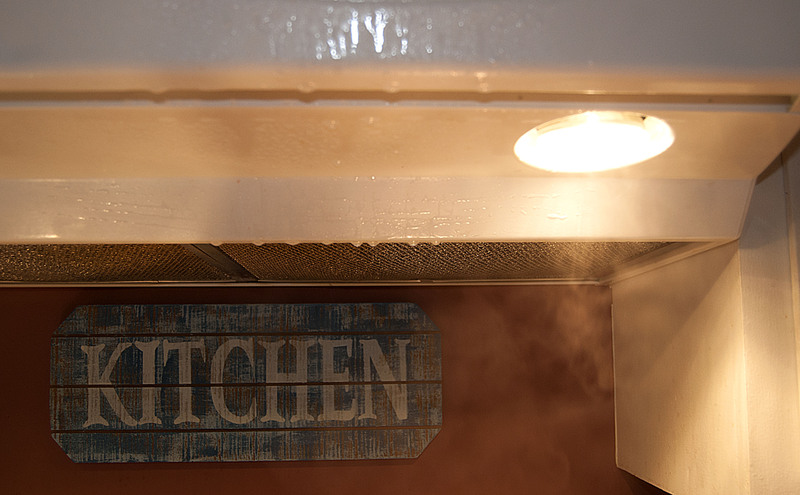 We had planned to boil our sap outside in four-inch-deep stainless steel steam table pans over our two-burner propane camp stove, but because of the rain, indoor evaporation was the only option. We have an electric stove with a hood and fan to nowhere. Seriously, it blows into the cupboards above the stove. It’s useless. I am also still learning how to use an electric stovetop after many years using gas, so our cupboards are probably coated in sugar now. Sticky! 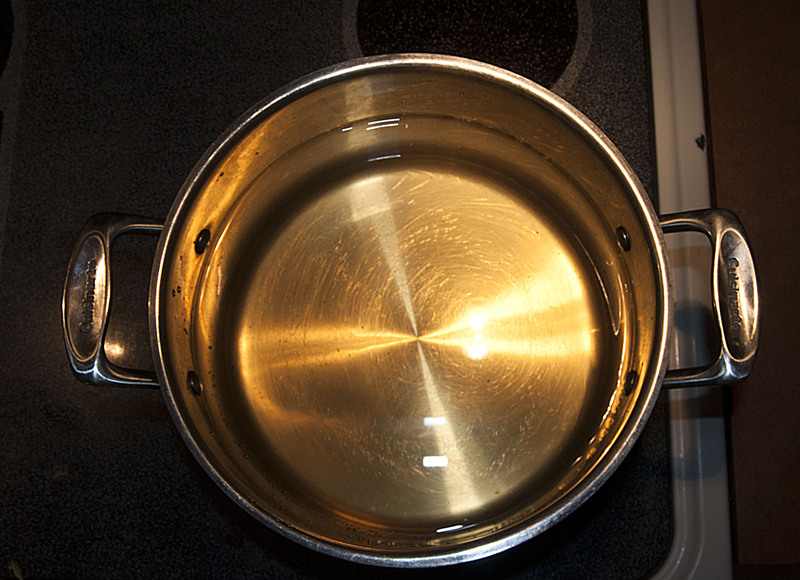 I put the burner on high and covered the pot until it came to a rolling boil and then turned the dial down to about 5. Does that mean anything to you? It doesn’t to me, but it looked like a soft rolling boil, so I left it like that, uncovered, and set the kitchen timer for one hour. After an hour, our kitchen looked like this. The windows also looked like this, not only in the kitchen but in the mudroom, living room, and stairwell, and the entire house smelled sweet and warm. The pot, however, looked like this. It amazes me how quickly this stuff evaporates. I see now why it takes 30-45 gallons of sap to make just one gallon of syrup. At this point I was still optimistic that we might get a quart. This is the first batch of the season, which is the “golden” or “fancy” syrup that is the most expensive if you buy it retail. This, I am pretty sure, is a clever industry trick because, as you can see, it looks exactly like it did when I started boiling it, only with more bubbles. This thin, golden ambrosia is still just sap. So I filtered it. This is my sophisticated filtration system. You like? 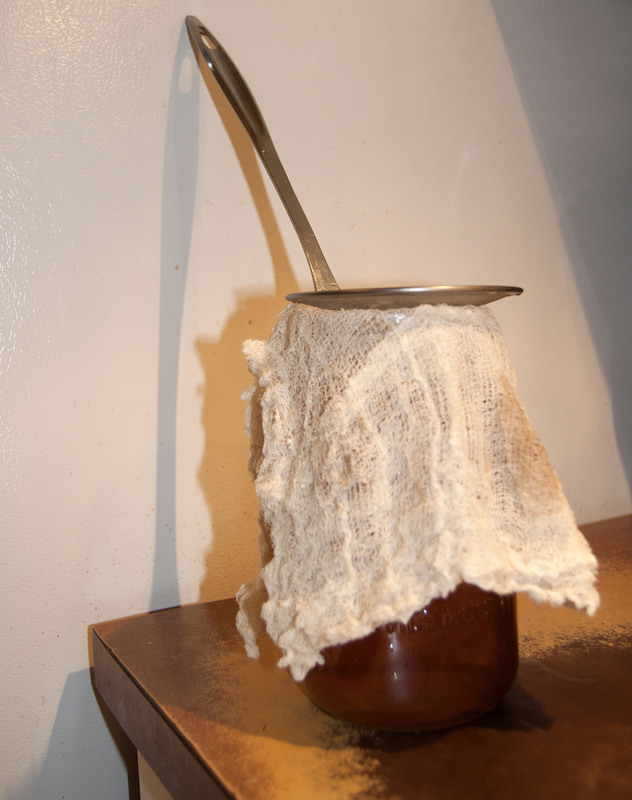 This is cheesecloth draped over a quart-sized Ball jar with a mini fine-mesh strainer on top. It worked like a charm. Once the sap really gets going a fine scum starts to form on it. I noticed some other more viscous material floating around in there as well, and the fine-mesh strainer worked to get that out too. I set the kitchen timer for another hour and went to go read books with Alistair. So this is what our sap-syrup looked like just before the final filtration. I was pretty conservative with my timing, so this is after nearly three hours on the stove. I was afraid it would boil down completely. What if it evaporated entirely and left us licking maple steam off our walls and windows between bites of pancake? However, as you can see, it darkened in color and there was still plenty in the pot. I filtered it for the last time into a pint-sized Ball jar, and it was nearly full. Here’s the finished product. Pretty, isn’t it? Tasty too. Nothing bitter or off tasting, as I feared because of the weather and the imprecise methods of collection we’ve used on this first go round. 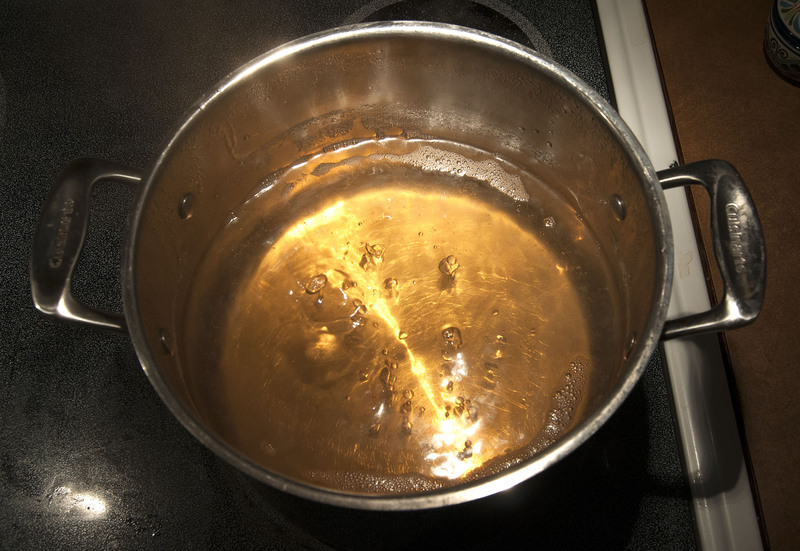 Other things of note: Professional sugarers recommend monitoring the temperature of the sap throughout the evaporation process, and when it reaches seven degrees above the temperature at which water boils (usually 212°), then it’s ready. There are also Baumé and Brix scales for determining temperature and sugar content, but that seems more important for larger quantities of sap. I used a regular digital cooking thermometer to monitor the temperature of the sap, and it worked just fine. In fact, many sugar bloggers suggest just watching the sap, which I also did. Of course, I was lucky enough to have a good assistant standing on his step stool laughing and pulling faces at his distorted reflection in the stainless steel pot. I hear this also guides the final product toward perfection. And now, I can’t wait for pancakes. 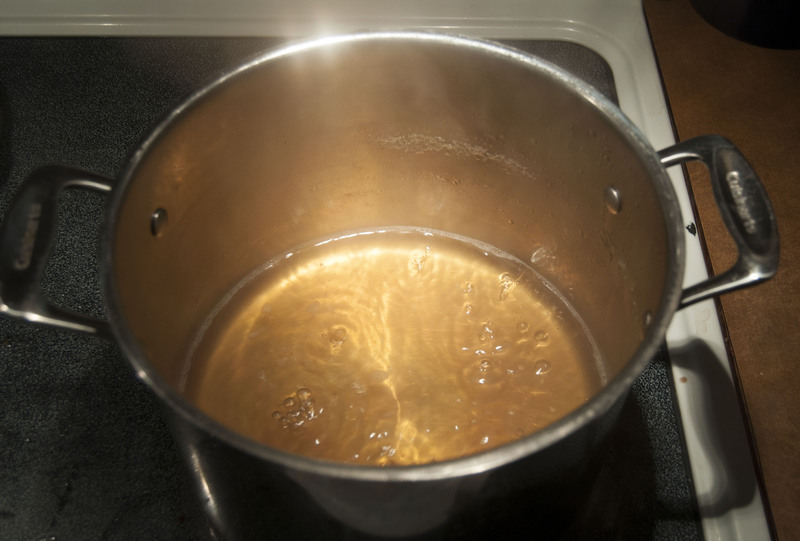 Posted on March 13, 2014 by Skye	• This entry was tagged boiling sap, maple syrup, sugaring, tapping trees. Bookmark the permalink. Awesome. I like your filtering procedure. I rubber-banded cheese cloth over the mouth of my milk jug sap containers, but this seems much more classy. And it doubles as a strainer for the boil scum — brill.